I visited the V&A a week or so ago. One of my favourite museums in London, the Victoria and Albert Museum is an eclectic mix of sculptures, religious art, design and fashion, but on this visit I wanted to spend some time in their Fashion section. One thing which really surprised me was the size of the shoes on display. All the shoes, from the 1700s until the 1960s, were tiny – something like a size 0, if there were such a thing, but terribly narrow with it. They were about the right size for my 8 year old if he had incredibly skinny feet! I know the outfits are very old and precious and probably need storing in particular conditions, but it was a shame that the exhibition was so gloomily lit. Not only because my photos didn’t turn out particularly well, but also because I found myself squinting to try and see details. Perhaps my eyesight is getting worse, but I yearned for some nice bright halogen type lighting like you’d get in a shop! 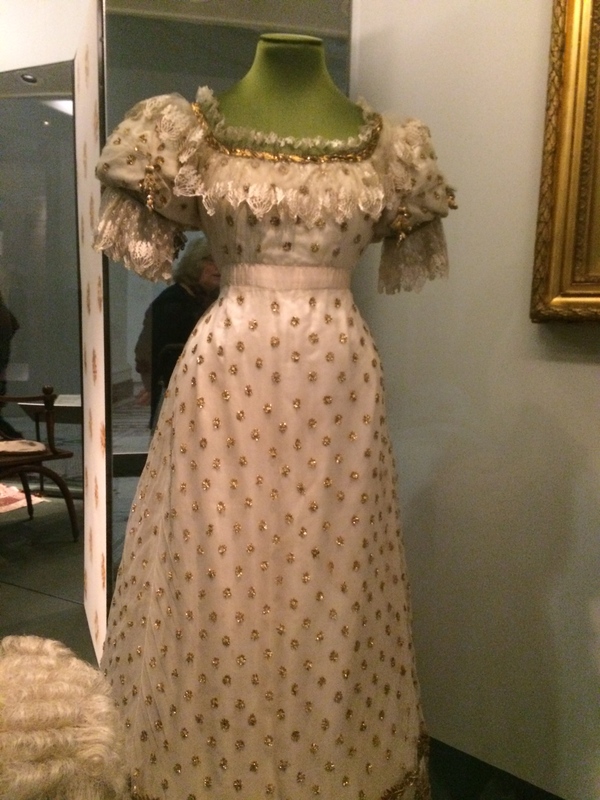 Here are some of my favourites from the 19th Century fashions, some of the information about them is really surprising! I’ll do a separate post later on the more recent fashions. Hope you like my choices! 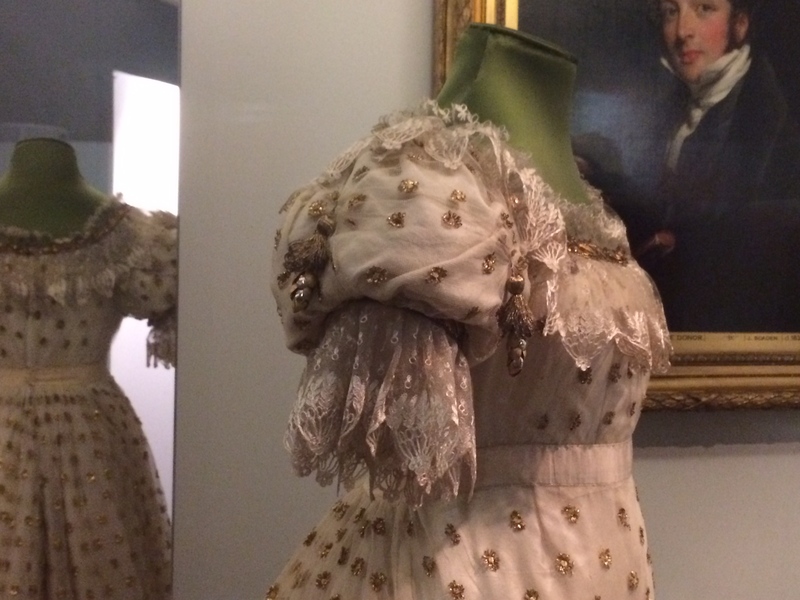 Above and below: A very Jane Austen style silk satin and silk net ball dress embroidered with metal c. 1820. 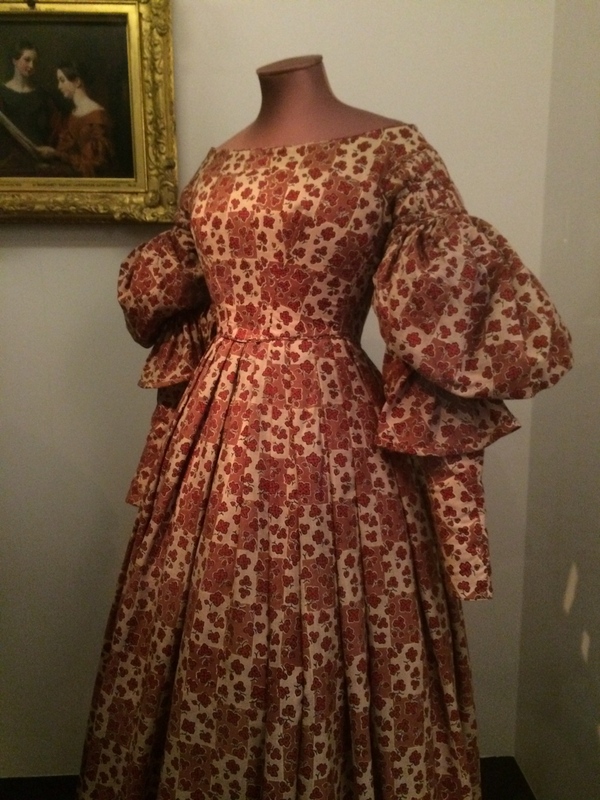 Early Victorian printed wool dress with full gigot (leg of mutton) sleeves from 1836. I had no idea they used printed fabrics at this time, I thought all fabric would be either plain, embroidered or lace! This is the type of underwear which would have been worn under a dress like the one above. 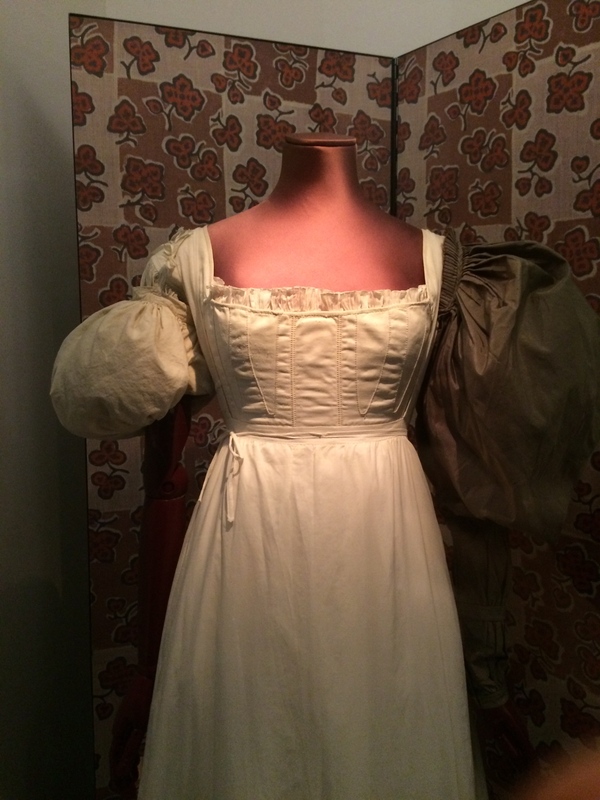 The sleeve padding is tied onto the shoulder.I assumed the padding would have been part of the dress, but I guess it would have been worn underneath rather like petticoats or crinolines would have been later. 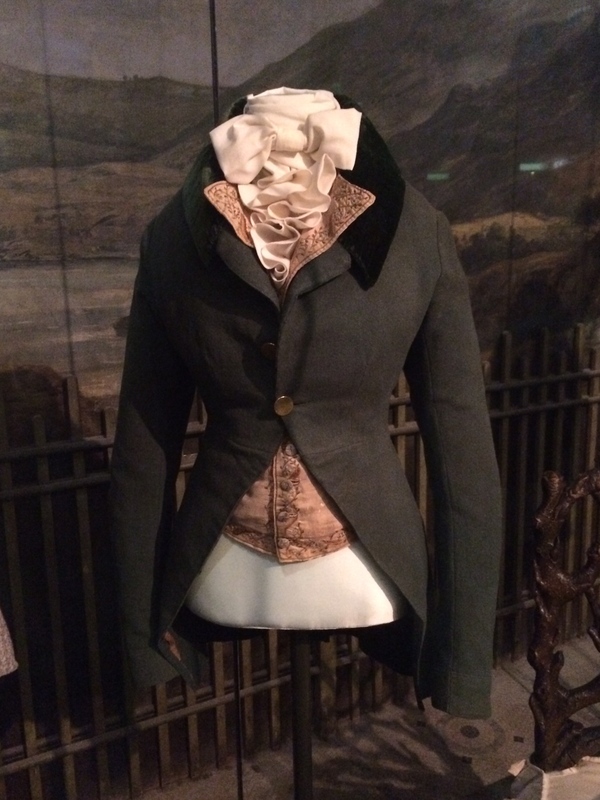 This is a woman’s riding jacket (it must be, just look at the cut), I think it’s from the early 18th century but I’m not sure (I forgot to make a note of what it was) but I wanted to include it because it’s such a handsome outfit! Very Mr Darcy but for a woman! I think this was a detail from a Victorian dress, again I didn’t get the details. I love the detailing on the sleeves. So beautiful! 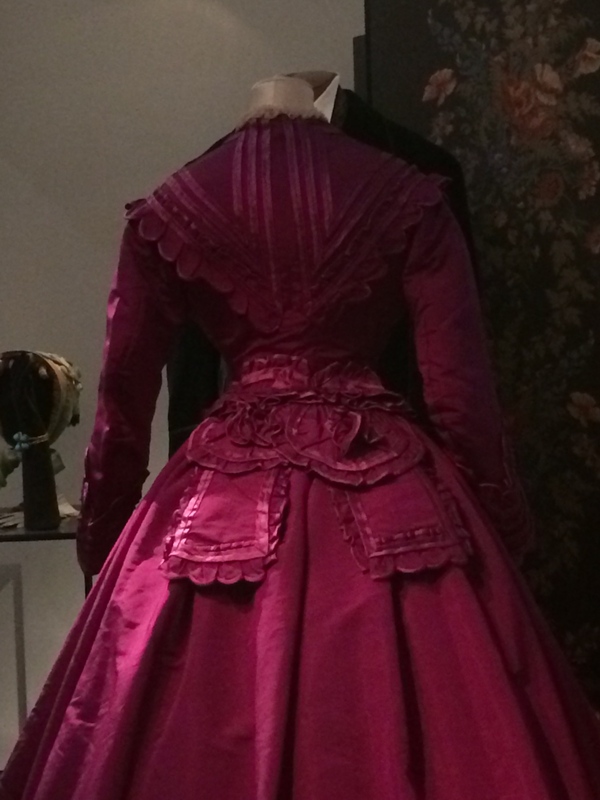 Victorian French dress in magenta silk from 1869-1870. Early magenta dyes often had traces of arsenic which could leak out during wear and cause skin irritations. 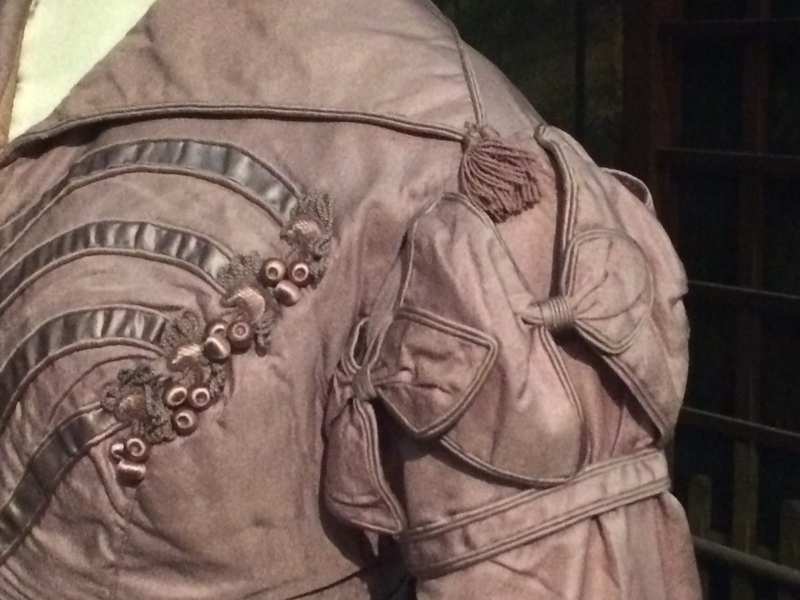 Back view of the Victorian dress, above. It must have been so heavy to wear, not to mention hard to breathe in a corset which makes your waist that tiny! A Victorian cage crinoline from 1960-1965. Steel spring frame covered with red wool and linen. Look at those teeny tiny shoes! They looked about a UK size 2, but about half the width of modern shoes! 1883 corset made from sateen, beige leather and whalebone with steel reinforcement on the bust.. Breathe in ladies! Thanks so much for the pictures and the details! I’m always amazed at clothes from this era.. these are no exception. Thanks Nancy, glad you liked them. I’ve only recently got interested in anything pre-1920s, so it’s been a real revelation. 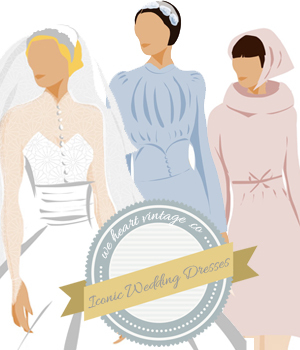 I want to go back and see their historical wedding dress exhibition next! This is awesome! My husband and I will be in London in the spring and this is a great reminder to visit the V & A. He’ll be delighted that there are examples of menswear (he always feels left out, poor soul). Thanks for the post.